If you are shaving your moustache and beard daily like me, an electric shaver will save you time. Having used two Braun shavers for the last decade, I made the switch to the Philips brand recently. There was a Philips carnival sale recently and I picked a higher end version (RQ1275) at $240. I will review the Philips 3D touch shaver and compare it against my Braun Series 370. Ladies who are looking to pamper your guys, this is a perfect gift and you will learn more about shavers here. Philips has a range of shavers that caters to your budget. From the cheapest to the priciest in this order: PowerTouch, AquaTouch, SensoTouch and SensoTouch 3D. The price difference between the lowest to highest end is about $250. I included reference prices along with the various models. The PowerTouch operates in a dry condition only so you cannot wash the entire shaver under the tap without killing it. The AquaTouch is like PowerTouch but allows wet operation. Going up another level, you have the SensoTouch - the platform that is holding the shaver heads flexes around. The behaviour is like the analog sticks of a game controller, albeit more rigid. Philips calls this feature GyroFleX - this means a better shave as the shaver heads adhere closer to your skin in the chin and neck area. The highest end model is the SensoTouch 3D. Having all the features of SensoTouch but the three shaver heads can now flex independently of each other. The shaver tracks are also different. Each of the three tracks on the shaver head catches hair of different length and coarseness. By reducing the number of features of the SensoTouch and slapping the label of "3D" on the superior model, Philips has found a way to take more money out of our pockets. As for me, I'm a sucker for more features - more is good. I bought the RQ1275 model which comes with a beard trimmer unit. Courts sells it for $399 which you can get it for cheaper. As I got mine during the Philips Carnival sale, it was only $240. 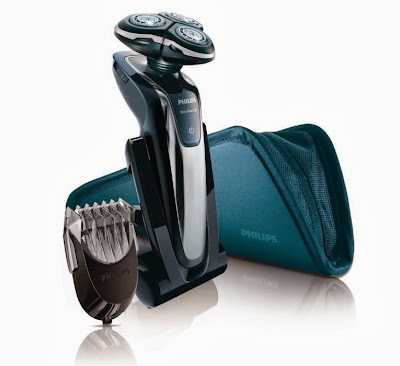 If you can keep your levelheadedness while buying shavers, I am confident that the low-end to mid-range Philips shavers will shave what ever type of man hair you have with ease. My first three shavers were all from Braun. Starting off the with the pocket shaver in army, I traded up to the mid range models. Braun's range starts from series 1 all the way to series 5. 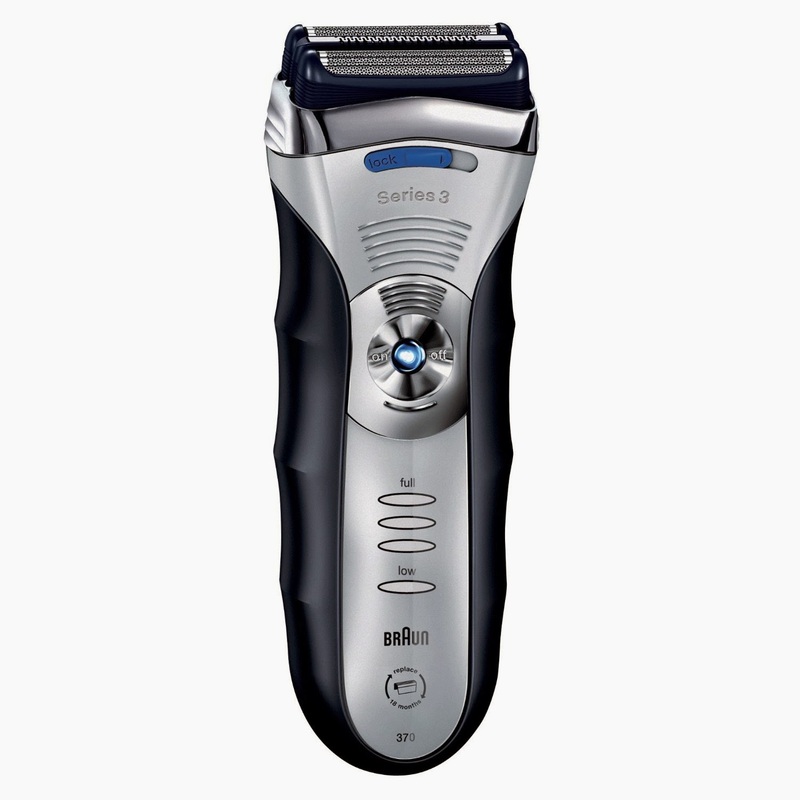 My last Braun shaver was the Series 370 and it was selling for $290 five years back. Although that shaver has never failed me, there was a slight lack of satisfaction that I couldn't quite place. Maybe it was the grass greener on the other side effect - when it was time to replace my shaver, I decided to try Philips. The studio shot of the Braun Series 370. Mine is all covered in grime. If you are still on the traditional razor blade, join the electric shaver revolution and be part of the 21st century. A good razor blade will give you the best shave, no doubt. When shaved cleanly, a razor blade cuts deeper and the skin feels smooth to touch. I can understand why one will stick to razor blades. I'm not asking you to give up razor. Keep that and use an electric shaver as an alternative. Unlike traditional razor blades, electric shaver is very safe and you never get a cut too deep from it. It is also very fast. In your sleepy state, you can rub the shaver around your mouth and chin without any focus. Imagine this, you woke up late and you need a shave. An electric shaver will have your face looking crisp like a college boy in a matter of minutes. You may be late but boy, you still look good. As for my little secret, I shave while reading the newspaper every morning. 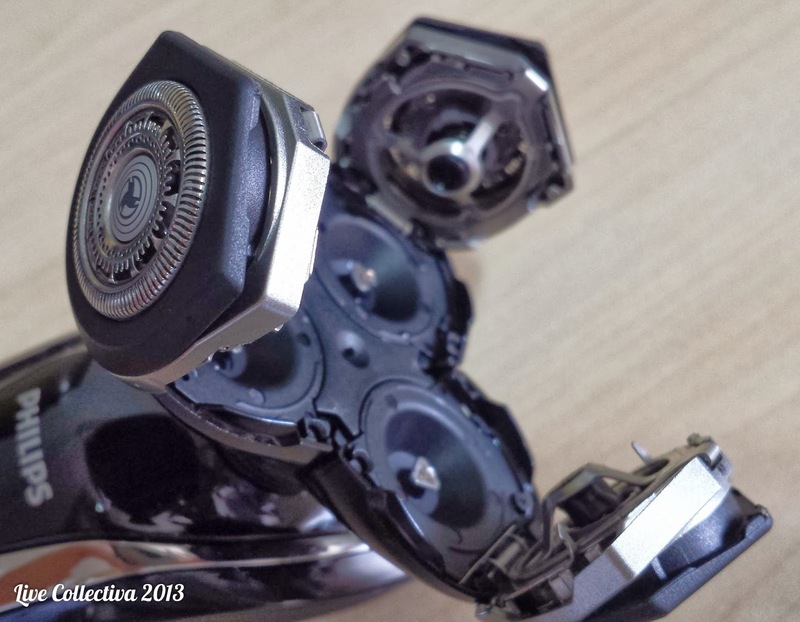 When comparing Philips and Braun, the difference that immediately strikes your eye is the shaver head. Braun's technology is a parallel set of curved razors that vibrates left and right. The razors are covered with a curved metal mesh. The mesh guides the hairs in and the razors swipe and cut the hairs off. In between the two set of razors, there is a thin stripe of cutters to trap longer hairs - this seldom works in my case. Philips has a different design. 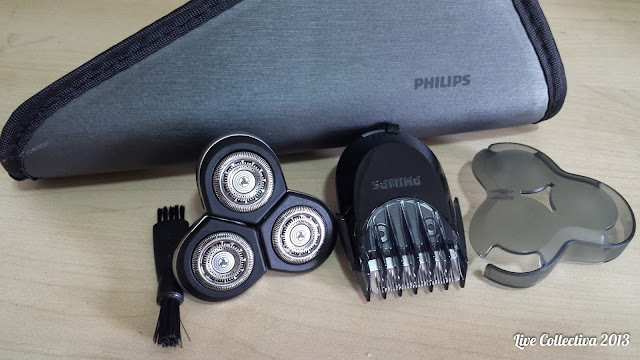 The shaver has circular razor heads that rotates in circles. There are three track of mesh to guide the hair in and trims it out by the rotation. Comparing both shaver, I noticed that the Philips shaver cuts cleaner and deeper. However, you need more hand movements to guide the shaver heads around. The shaver head is fully detachable from the body and you can snap on the beard trimmer unit (see the earlier photo). The model that I bought came with the beard trimmer. My recommendation is to buy this model only if you have beards to trim (Movember anyone?) - you are paying extra for this. Both shavers comes with fine hair trimmers. On the SensoTouch, there is small switch that that pushes the trimmers out. This is good for catching those fine hairs around the side burns. The advantage of an electric shaver is the ability to shave without wetting your skin or covering it with foam. The mesh ensures that the razor never cuts deep enough to reach your skin. 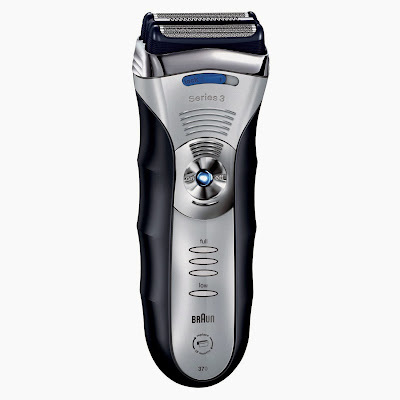 When it comes to dry shaving, the SensoTouch beats the Series 3. My Braun shaver misses strands of hair and sometimes yank the hair till it's painful. The SensoTouch head fits the contour of the jaw and neck better, capturing more wild strands of hair and doesn't pull. The dry shaving experience with the Philips is more pleasant. Both shavers are equally nice to grip. 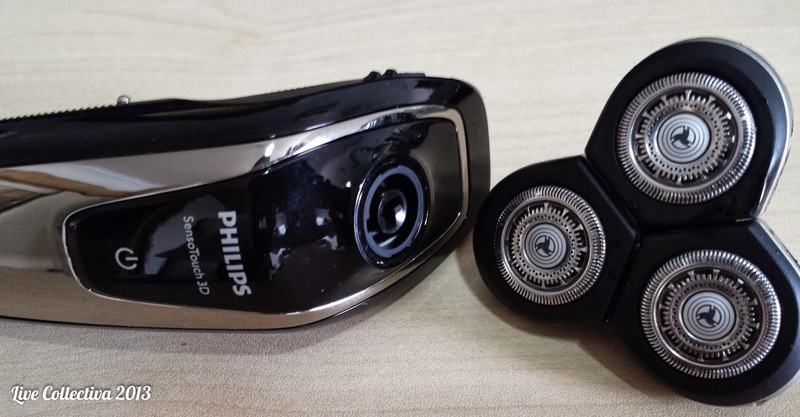 Braun has rubberised sides while the Philips has a rubberised back. You get a good grip even if the shavers are wet. For those who enjoy shaving while taking a hot shower, you are covered here. People with big hands will like the Braun's fatter body more. When gripping the shavers, both feel heavy and solid - there is not flex or creak when you grip it hard. With waterproof shavers, washing the is easy for both Philips and Braun. The Philips shaver head opens up like the mouth of the Alien lifeform in the movies. This gives you access to the inside of the blades and the hair dusts washes off under running water. I find that the best way to wash them is to spray them with jets of water. You can make one by pressing your thumb against the tap head. The jets will flush out any lingering hairs. There are models that includes a washing unit called the Jet Clean stand. The stand washes the shaver head automatically when you stick it in. For that, you have to fork another $100 plus more and makes you feel like Tony Stark. Braun's motor is powerful and loud. When you turn on the Braun shaver, you can feel the motor beating against the shaver body like a beast about to be unleashed. You feel like a macho man holding this shaver. On the other hand, the Philips motor is a gentle whirring sound. Do not mistake this for weakness. The three heads will remove hairs like a thousand blades swiping through. Both shavers run on rechargeable battery. The rechargeable battery is sealed and non replaceable. By sealing the battery in, the manufacturer water-proofs the shaver. In my experience, the battery will last at least five years. On a full charge, the shaver runs for 3 minutes a day and lasts for four weeks. Charging a low battery to full takes an hour. The Philips 3D shaver comes with an elegant charging dock that lets you drop your shaver. It's hypnotic to watch the beautiful led lights as it charges. Braun only has a charging cable which you plug it in, similar to charging your phone via USB. You can continue to shave while charging, especially useful when the battery is dead in the morning. The futuristic LED lights blinks gently as it charges. The Philips SensoTouch 3D is a premium quality product - from the build quality, the shaver head to the charging dock. Every dollar was worth it. This is the shaver to go for when you want to pamper your skin. You will leave your house looking fresh and sharp every morning.